Rosemark Senior Community is a newly completed AL/MC community that raises the bar for senior living in the Denver metro area. Located at the Southeast corner of 8th avenue and Jersey Street, the tight, urban nature of the site presented both challenges and opportunities that led to exploration of innovative design concepts for seniors living in urban environments. Situated near a Mayfair Park on a 2.25 acre site along a primary collector street, the building has a modified C-shape footprint. 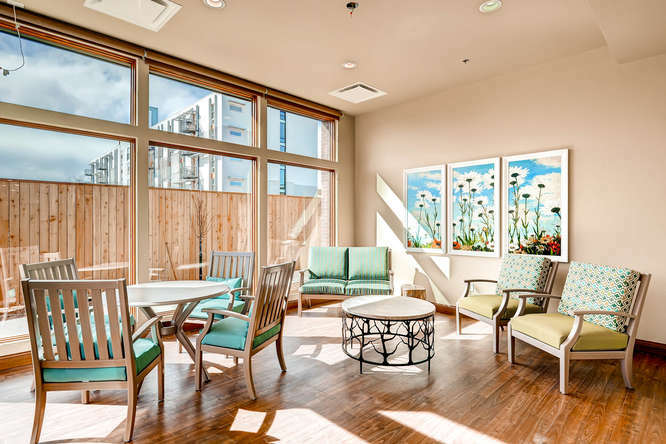 The building consists of four program components: 57 assisted care residential units, 31 memory care residential units, amenities and support spaces, and parking. The building is approximately 73,550 GSF. The building is two stories with a partial basement level. Exterior materials consist of masonry, in conjunction with wood and cement fiber board panels layered to create a warm, residential feel and provide a human-scale to the exterior. The building footprint allows for successful integration of indoor and outdoor spaces and functions within an urban setting. There is on-grade parking along the North side of the building accessed off Jersey Street with 52 parking spaces for staff and visitors in the off-street parking area. A one-way pull through with porte cochere accesses the main entry into a grand 2-story atrium displaying many interior amenity elements with direct views into the richly appointed courtyard beyond. The south facing court is large and contains luxurious amenities including rich, varied landscaping. Both the memory care and assisted living components have their own garden courtyards with ample opportunities for walking.